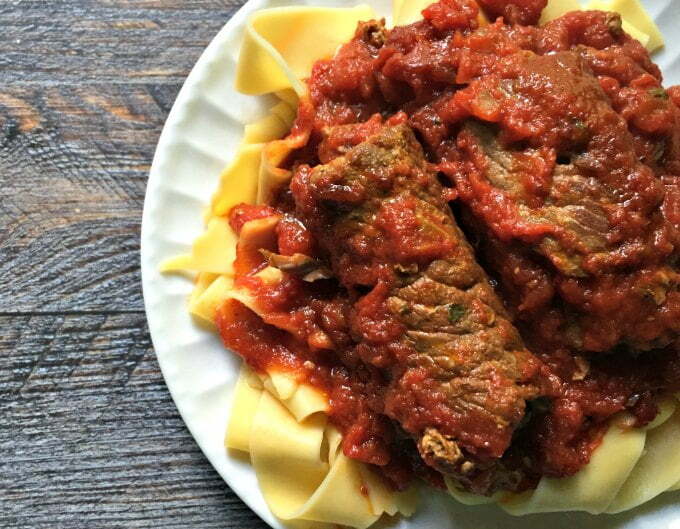 This Paleo slow cooker braciole makes an easy, tasty meal for your family. 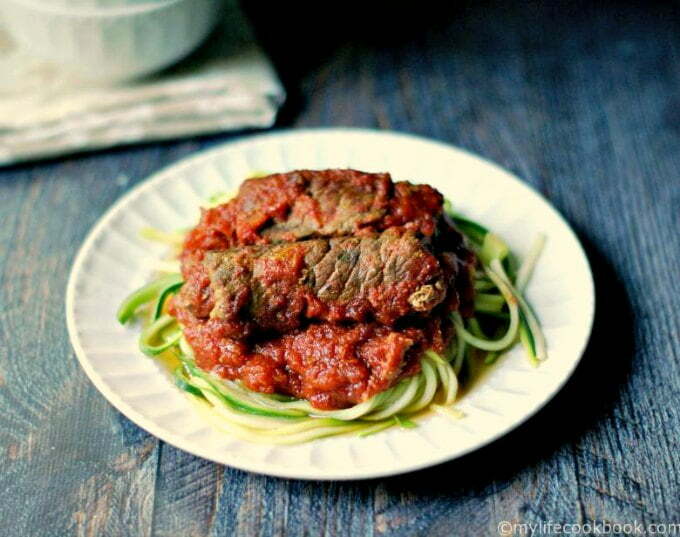 Serve over noodles for a traditional dish or over zucchini noodles for a Paleo version. 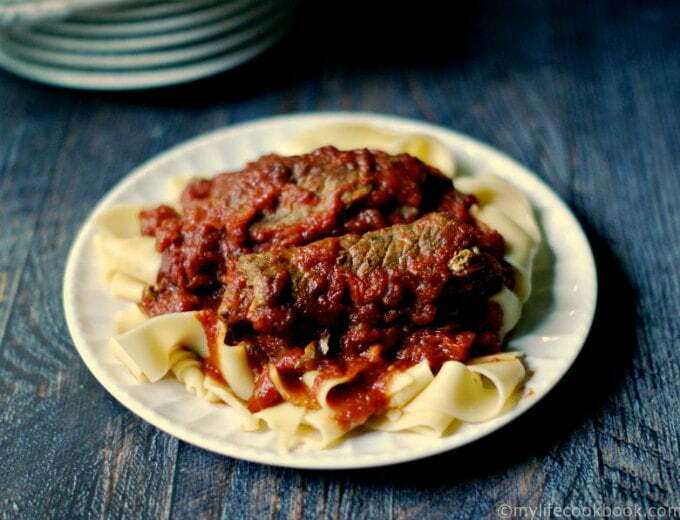 This gluten free slow cooker meal is one your family will love! 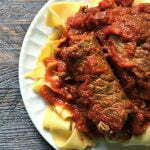 I recently saw a recipe for Skillet Braciole on my friend Christie’s blog, A Kitchen Hoor’s Adventures. It brought back memories of my mother (or was it my oldest sister?) who made braciole for us a long, long time ago. I remember I loved the garlic and cheese mixture that was rolled into the meat and the rich and tasty sauce. 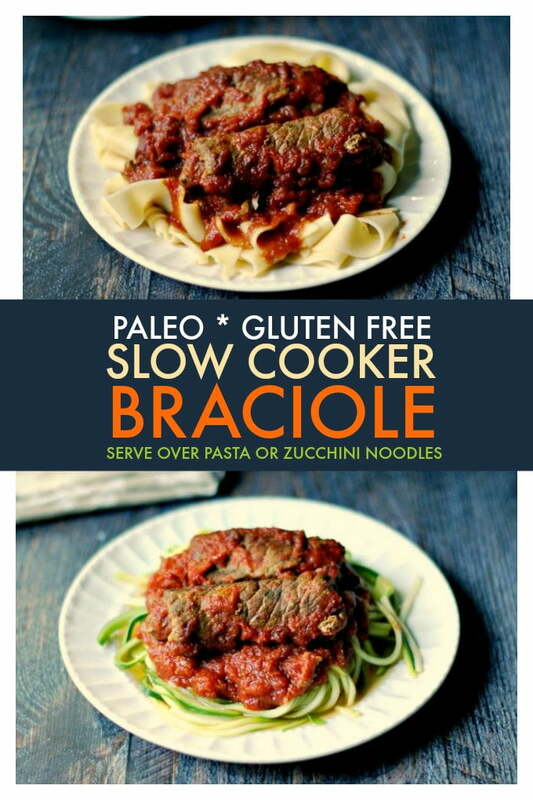 So today I wanted to make my own Paleo version – Paleo slow cooker braciole. 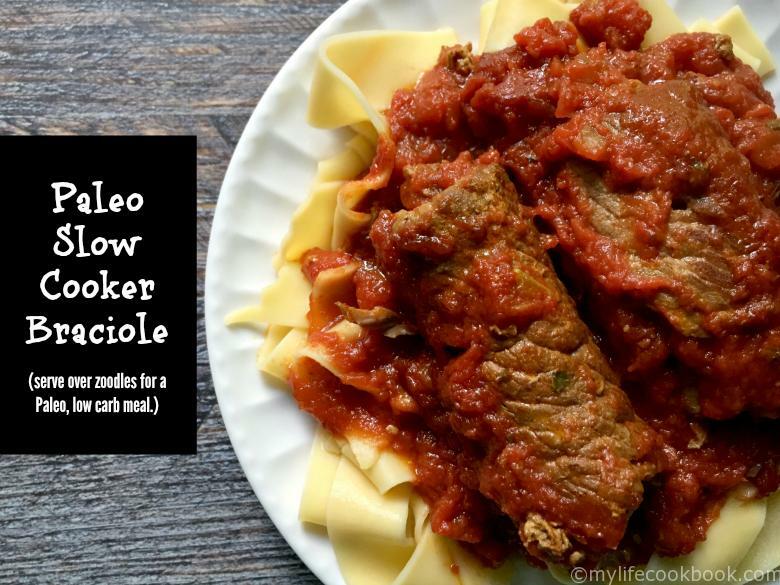 I also wanted to make this beef braciole recipe in a slow cooker because so far this summer I am realizing that I no extra time at all. Using the slow cooker for this easy family meal can be a life saver. This recipe is really very simple. I bought a package of very thin steaks at my grocer that was conveniently labeled braciole steaks and they were buy one get one free! They were already about 1/4 inch thick so if you buy thicker meat, try to pound it out so it’s 1/4 inch thick. I cut the large steaks into 9 small pieces. I had about 1 1/2 lbs of meat to work with. Next I made the filling. I just put the ingredients (almond flour, Parmesean cheese, parsley and garlic) in a food processor and pulsed until it was well mixed (see first picture above). Taking a piece of the cut meat, I brushed some olive oil on it first and then spread about 2 Tablespoons of the mixture all around. (see second picture above). I rolled up each piece of meat and put a toothpick in them to keep them together. 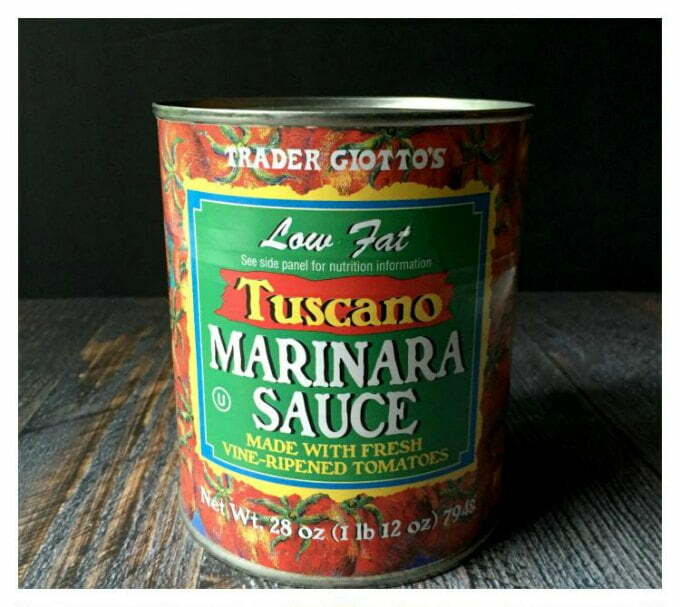 I took a shortcut and used two cans of Trader Joe’s Tuscano Marinara sauce. 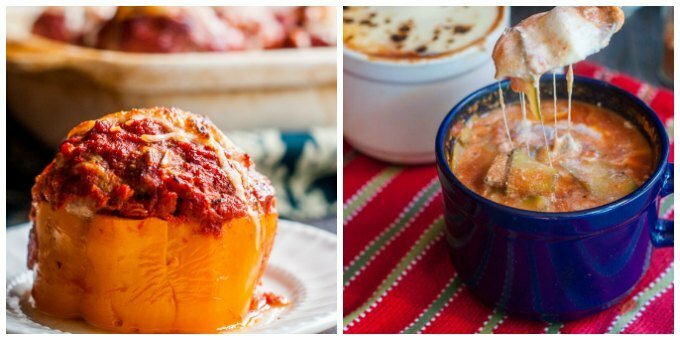 I’ve used it in my cheesy meatball stuffed peppers and easy zucchini lasagna soup. The flavor of this sauce is fantastic and I highly recommend it but you can use any kind of pasta sauce you want. The meat will just add more flavor to it. After browning the rolled up meat on both sides for about 4 minutes each (you have to take out the tooth picks to do this), I added them to my slow cooker along with the marinara sauce. I cooked them for about 8 hours on low but every slow cooker is different. The meat just fell apart when it was done and that’s the way I like it. You could probably do it in less time if you like. Just make sure the meat is done. Then we served it over wide noodles for Max and my hubs. And over zoodles for me. So you can see we have a Paleo version of this meal (zoodles) and a traditional version (pasta). I just used almond flour instead of breadcrumbs and of course you can just use breadcrumbs if you like. My husband was very complimentary of this meal so I will definitely be making it again. Who doesn’t like compliments? 😉 I hope you will give it whirl and let me know what you think of it. Cut braciole steaks into pieces roughly 3-4 inches by 2-3 inches. Make sure they are thin. if you are using a different kind of meat, pound until they are 1/4 inch thick. In a food processor add the almond flour, Parmesan cheese, parsley and garlic and pulse until well mixed. Lay the meat flat on a cutting board or plate. Brush olive oil on top and the sprinkle about 1-2 Tablespoons of mixture on top. Spread evenly and then roll up. Place a toothpick in it to keep it together. Finish with the rest of the meal. Heat a large skillet on medium high and add the leftover olive oil. Brown the braciole on both sides. This should take about 4 minutes on each side. Take out the toothpicks to brown the other side and reapply them. When finished browning add the meat to the slow cooker and also the cans of sauce. Cook on low for 8 hours or until the meat is tender. Oh thank you Raia! You are the best! I don’t think I have ever had braciole! But looking at your recipe makes me want to try it! I’ve been looking for some new slow cooker recipes to try this summer when it’s too hot to turn on the oven, and this is going to the top of my list, it sounds amazing! Thanks for sharing at What’d You Do This Weekend?! Hi, just stopping back to let you know that this was one of my favorite posts from last week’s party and will be one of my features tomorrow at What’d You Do This Weekend? I hope you will join us again! Aw thanks Joy for featuring me! Looks so delicious! Thank you for linking up to Creative K Kids’ Tasty Tuesdays. I have pinned your post to our Tasty Tuesdays Pinterest Board. I used to eat braciole all the time growing up when my parents had a restaurant because my mom made it in the crock pot too. I like how you made it paleo and non paleo! Will be making this a lot next month! Great! I hope you like it! How luck for you to have a restaurant in your family. That seems so cool to me.